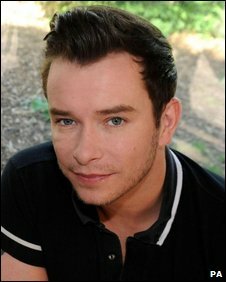 Stephen Gately's grief-stricken bandmates have escorted the late singer's body back to his hometown. The group arrived at Dublin Airport as Gately's family and close friends prepared to pay their respects at a private service on Friday night. The funeral is to take place at St Laurence O'Toole's Church in Dublin at midday on Saturday. Gately was found dead at his holiday home in Majorca last week. A post-mortem found he died of natural causes. About 300 people lined the streets near the church, greeting his coffin with gentle applause. His body's arrival comes as more than 1,000 complaints were made about a Daily Mail column written by Jan Moir on Gately's death. 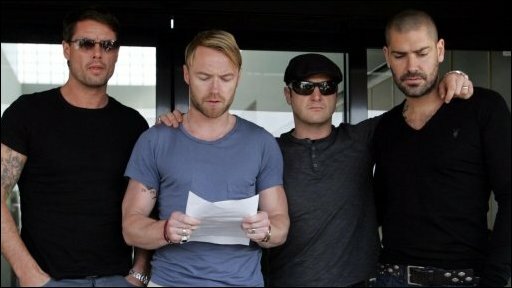 Before leaving Majorca, Ronan Keating stood arm in arm with Mikey Graham, Shane Lynch and Keith Duffy, and spoke of the band's grief. "Last Saturday, our world changed forever when we lost our friend and brother." "The countless messages of love and support we have received this week have truly overwhelmed ourselves and the Gately family. "We thank you from the bottom of our hearts for each and every one of them." In a trembling voice, he added that Gately would be given "an unforgettable send-off" in Dublin. Keating appeared to have a new tattoo on his arm with the dates 76-09 as a tribute to Gately, who was 33 when he died. Reading from a statement, the singer continued: "Stephen lived to perform and truly loved being centre stage. "You can be sure he's looking down now wishing we'd move over so he could flash a smile for the cameras one more time." Keating admitted the future of the band was "too hard to even think about" but whatever happened "nothing will ever be the same without our dearest friend Stephen". He also appealed for the media to continue respecting their privacy. Thousands of fans and celebrities are expected at the funeral. Friends and neighbours have been cleaning the church and surrounding areas in preparation for the ceremony. Instead of flowers, mourners have been asked to make donations to the Caudwell Children Charity, for which Gately was an ambassador. Boyzone yesterday visited Father Declan Blake at the church to discuss funeral arrangements. 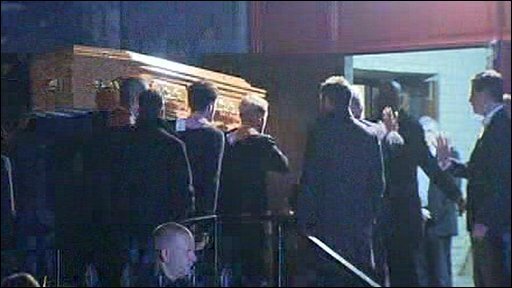 The group are expected to stay with Gately's body in the church overnight, and are likely to sing at the ceremony. Gately's manager Louis Walsh has confirmed he will not appear on The X Factor this weekend as he attends the funeral.